Like silk or wool, leather is a fine, natural product. With leather, each hide is unique and features its own texture, color, and natural markings. There are even differences within a single hide. Therefore, it is not unusual to see color differences, grain changes, and even scars or brand marks on a piece of furniture. 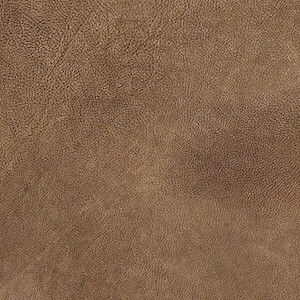 Different types of leather show these characteristics in different degrees, with some types of leather processed to eliminate these natural marks altogether and others left largely unprocessed to showcase them. 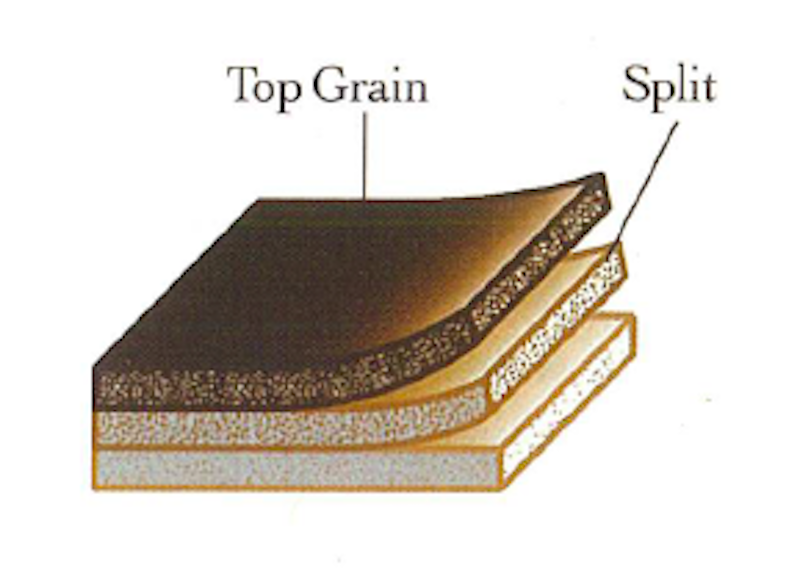 Top Grain leather is the uppermost — top— layer of a hide. After it is tanned but before it is finished, the leather hide is mechanically split into layers. Top Grain is strong and durable and will feature the “hallmarks of the trail” – wrinkles, scars, insect bites, and other natural features. Top grain is the superior part of the hide. Separated from the Top Grain is what is called the Split Hide, used to make suede and other leather products. Splits are not considered as high quality as Top Grain leather and are not as strong. They are more likely to fade, stretch out, and tear. Some furniture manufacturers use Split hides on the sides and backs of furniture — areas where the consumer wouldn’t typically be touching or sitting upon. What is the difference between Full Grain and Corrected Grain Leather? Full Grain leather is top grain leather that has not been buffed or sanded, so that the natural texture or grain remains intact. Markings, “the hallmarks of the trail,” will remain on the hide. So, stretch marks, scars, brands, insect bites, etc. may be visible. The natural look and feel of the leather is preserved. With Corrected Grain leathers, most natural markings are lightly buffed or sanded off and an artificial but natural looking grain is embossed upon the hide. Corrected Grain leathers are still top grain leathers. They have been altered to feature a more consistent texture and coloration. What kind of leather becomes furniture? Only one-third of the hides produced in the world is suitable for furniture upholstery. Whole hides that feature just minimal imperfections are required and only about 5 percent of the supply meets the aesthetic qualities demanded. While the hides to be used for furniture can exhibit some natural marks and scars, they must be more pristine than hides that will be cut into smaller pieces and used for belts, shoes, and small leather goods. 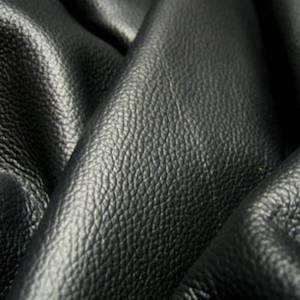 Leather hides utilized for the automotive industry require extensive processing to meet requirements for durability and heavy wear, so these hides are generally not as rare or precious as the hides used to make sofas, loveseats and chairs. Furniture requires pure aniline, full grain semi aniline, or corrected/embossed leather. This is the most natural, “organic” type of leather. 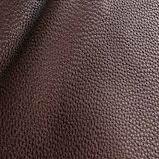 Also called Pure Aniline or Full Aniline, this leather does not have a protective coating. It has not been treated or processed to alter the natural grain, look, or feel of the original hide. Aniline leather features the most luxuriously soft feel of all the leather types — but it is more susceptible to fading, staining or soiling. 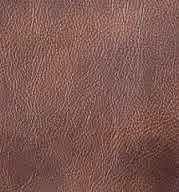 This is a good type of leather for a customer who wants the soft, natural feel of leather and will appreciate and value the beauty of the leather’s unique natural markings. The expectation should be that the furniture will receive only light to moderate use. 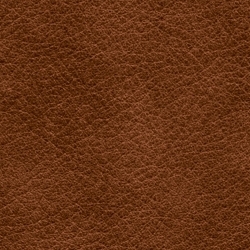 Although not as pure and natural as Aniline, this type of leather still retains some of the characteristics of Aniline leather. After the hides are aniline-dyed, they are sprayed or rubbed with a slightly protective topcoat. There might be an additional color added as well, to create a two-tone or other look. Some of the natural markings might show through the topcoat, so wrinkles, scars, and bites may be visible as in Aniline leather. 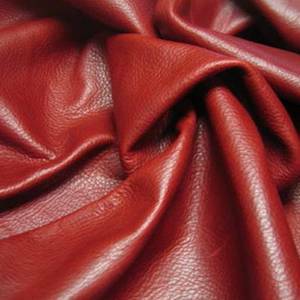 While Semi-aniline leather is indeed more protected than a pure Aniline leather and while the color will probably be more uniform, this leather is still at risk for fading, staining, etc. This is a good type of leather for a customer who values the softness and texture of natural leather but will use the piece of furniture regularly. This is the most durable type of leather, but not the most natural. That’s because the natural markings have usually been removed through sanding or buffing. Then an artificial grain is embossed onto the hide. This results in a consistent grain and coloration, which some customers desire. In addition, the surface is generally sprayed or rubbed with a protective topcoat with color in it. Adding this layer usually subtracts some of the natural softness and breathability of the leather hide. In a Pigmented leather, the color might not be as deep and rich as an Aniline leather and it might not feature the luxurious hand, but it is the most durable and cleanable leather type. This is a good type of leather for a customer who is willing to give up some softness and natural texture for more practicality. Soft and luxurious, Nubuck is a top grain leather that has been lightly buffed or sanded to result in a suede-like appearance with a slight nap. 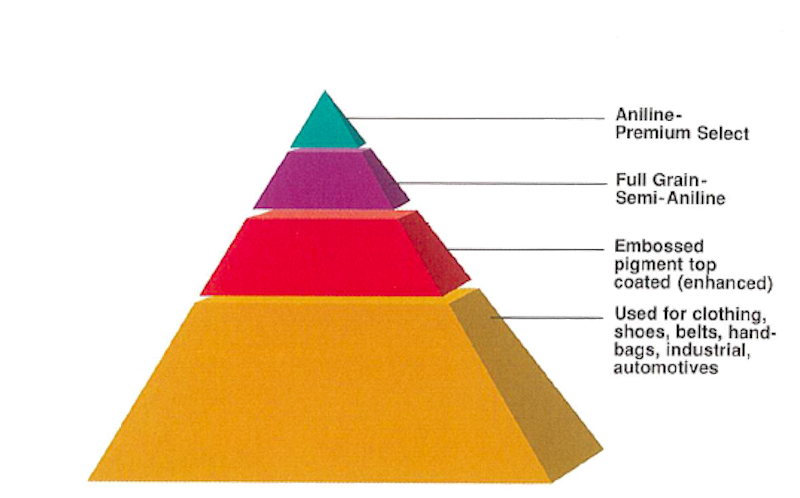 It is important to note however, the Nubuck is a top grain leather and therefore stronger and higher quality than suede. Nubuck leather is a very fine, natural product and usually does not have a protective topcoat. It is very susceptible to fading and soiling. This is a good type of leather for a customer who wants a unique, fashionable and very comfortable leather that requires some extra care and maintenance.